All registered students (students taking classes) are entitled to a Student ID card. It serves as your official UCC photo identification and is required for setting up a UCC Library student account. Student ID cards are available from the Student Life Office in the Campus Center building. Call 541-440-7749 for ID processing hours. Student ID cards must be validated each term you are enrolled. 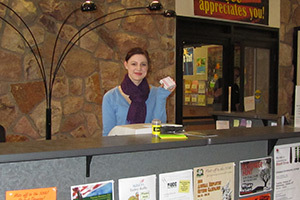 Validation stickers are available at the Information Desk in the Campus Center and at the Library Circulation Desk. Students no longer need to have a parking permit. Students may park in the spaces marked by yellow or white lines and/or student only signage. Contact Security for any concerns at 541-440-7777. 2585 NE Diamond Lake Blvd. 10% discount of booking when UCC mentioned.